Kilkenny City, located at the heart of Ireland's Ancient East in the South East of Ireland, has so many fun things to do and is a 'must visit' on the best destination bucket lists. From its rich Medieval history, to its bustling pubs and restaurants and its great selection of shops, craft sudios and galleries; whatever your reason for visiting you won’t be disappointed. The 4 Star Kilkenny Ormonde Hotel is located in the heart of Kilkenny City and with a great selection of Kilkenny Hotel Breaks, it is the ideal base for exploring Kilkenny City. Our 4 Star Kilkenny Hotel has a great city centre location, only a short 3 minute stroll to Kilkenny Castle, The Medieval Mile or the many shops and restaurants in Kilkenny City Centre. This makes Kilkenny Ormonde Hotel the perfect hotel base if you want to try many of the fun things to do in Kilkenny during your stay in Kilkenny. During the summer months, why not make the most of Kilkenny Ormonde Hotel’s great location and take a Family Picnic to the Castle Park. 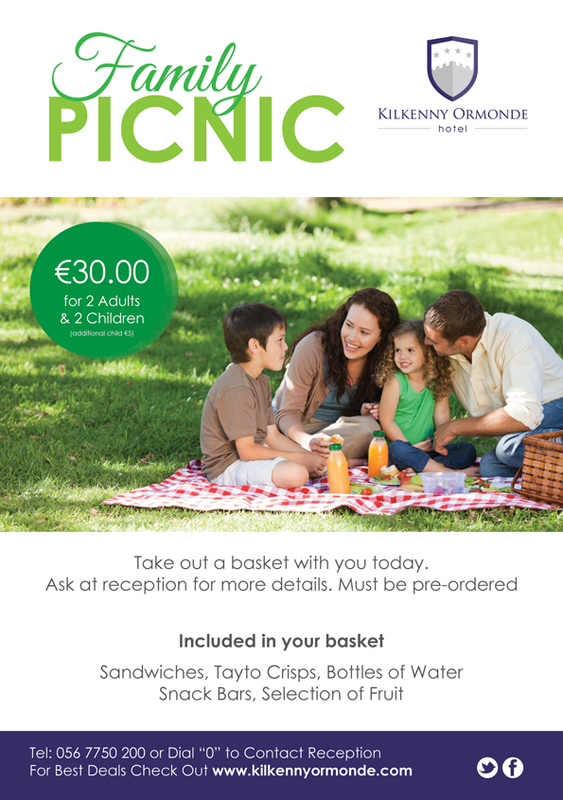 Picnic cost is€30 for 2 Adults and 2 Children Available July and August. Please enquire at Reception. Kilkenny Ormonde Hotel offer a great selection of hotel deals throughout the year, view some of our latest offers – Kilkenny Hotel Breaks. Wondering what to do in Kilkenny or looking for fun things to do in Kilkenny, visit www.visitkilkenny.ie and browse their amazing range of Kilkenny activities or browse our list of fun things to do in Kilkenny below. Enjoy an hour’s walking tour through Kilkenny, accompanied by a humorous & informative guide. A popular way to get to know the medieval capital of Ireland & to spot the best shops to explore. Just a 3 minute walk from the Ormonde Hotel, a visit to the Castle is a must. Information packs provided on a self-guided tour with trained guides to assist along the way. Mondays & Tuesday from 6.30pm teaches any visitor how to play the bodhrán (Ireland’s native drum) as well as interesting information about the history of the drum – might.. Free of charge. You can really get close to the action! A small family fun glassblowing studio located in the picturesque valley of the Nore River. The best weekend of your life awaits in Kilkenny this June Bank Holiday weekend! Comedic stars and stalwarts from all over the world running a muck in this little medieval city.